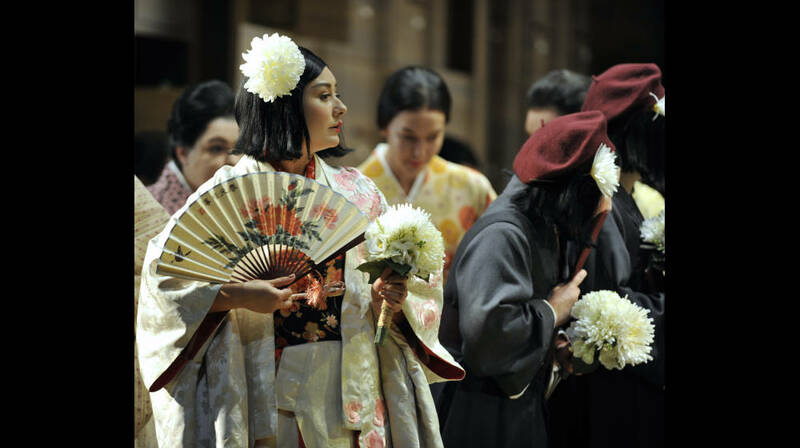 Watch Madama Butterfly LIVE on this page from 6.30pm on Thursday 21 June. This video is no longer available. Join us this summer for our next free online streams – Saul and Vanessa – or check out our YouTube channel for more opera extracts. 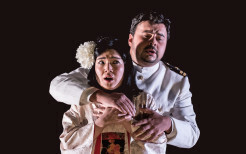 Bookmark this page and set a reminder now so you don’t miss out on Madama Butterfly streamed live* from this summer’s Festival here from 6.30pm on Thursday 21 June. After the live* stream the opera will be available to watch here on demand until 11.59pm on Thursday 28 June. From Thursday 26 July you will be able to watch Saul, captured live at Festival 2015, on demand until Thursday 2 August. 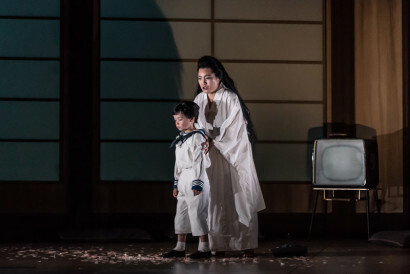 You can see Madama Butterfly live* from Festival 2018 in cinemas across the UK on Thursday 21 June. Benjamin Franklin Pinkerton, a young US Navy lieutenant stationed in Japan, has arranged with Goro, amarriage broker, to acquire a 15-year-old Japanese bride, Cio-Cio-San(also known as Butterfly). Pinkerton has taken a 999-year lease on a home overlooking Nagasaki harbour; this lease, as well as hismarriage, can conveniently be cancelled at a month’s notice. Sharpless, the American Consuland Pinkerton’s friend, arrives to witness the signing of the wedding contract. He warns Pinkerton not totreat the marriage lightly, as his bride-to-be is truly in love with him. Pinkerton claims to be smitten withButterfly, but he then proposes a toast to the American woman he will one day wed. Butterfly arrives. She tells Sharpless that her family was once wealthy, but hard times forced her to become a geisha. After Butterfly admits that her father is dead, Goro tells Pinkerton that he committed ritual suicide atthe Emperor’s command. Butterfly’s relatives arrive and the formalities proceed. The festivities areinterrupted when the Bonze, Butterfly’s uncle, enters to denounce her for forsaking their ancestralreligion. Pinkerton angrily orders the guests to leave. He comforts the distraught Butterfly, and thenewlyweds proclaim their love. Pinkerton has been gone from Nagasaki for three years. Suzuki, Butterfly’s companion, fears that he willnot keep his promise to return, yet Butterfly is sure that he will. Sharpless arrives to read Butterfly aletter he has received from Pinkerton, who has since taken an American wife. Goro interrupts, usheringin Prince Yamadori, a potential suitor for Butterfly who she dismisses. When Sharpless finally readsPinkerton’s letter to Butterfly, she gradually realises that she has been abandoned. She sends for heryoung son, Sorrow, certain that Pinkerton will return when he learns that he has a son. Butterfly insiststhat she would rather die than be a geisha again. Suddenly, a cannon booms in the harbour, signalingthe arrival of Pinkerton’s ship. Butterfly and Suzuki decorate the house and await Pinkerton’s return inan all-night vigil. Early in the morning, Pinkerton, his American wife Kate, and Sharpless arrive at Butterfly’s house. Butterfly is asleep, so they ask Suzuki to tell her that they wish to take Sorrow away to live with them inAmerica. Pinkerton flees in remorse. Butterfly enters to discover Kate there and soon realises who sheis. She reluctantly agrees to surrender her child if Pinkerton will come for him in half an hour. Afterbidding farewell to Sorrow, Butterfly takes the only option she feels is left to her. Pinkerton rushes intothe house and faces the consequences of his actions. An exploration of the music at the heart of this tragic tale.